The Saudis have kept their production levels high since last year in order to drive other players (especially U.S. shale drillers) out of business. Equally clear is the fact that this strategy of maintaining the glut and driving out rivals has not worked so far. Even when we look at the refining sector, we see that the oil kingdom has been following a similar strategy of flooding the markets with refined fuel. The Saudis have already sparked an oil price war with the Asian refiners downstream by offering close to 2.8 million barrels of low sulfur diesel to the European and Asian markets. This has caused Asian refining margins to fall drastically, the effects of which can ironically now be seen on Saudi Arabia itself. This made the Saudis blink and they started offering discounts on its medium and heavy grade crude oil to Asian customers. 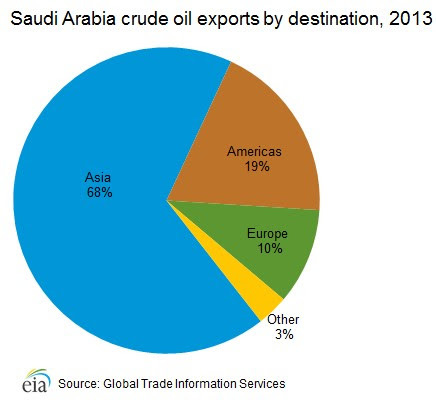 In addition, in a latest development, the Saudis are now trying to defend their market share as they have only marginally increased the price of the crude oil they sell to Asia, contrary to industry forecasts. "It is becoming apparent that non-OPEC producers are not as responsive to low oil prices as had been thought, at least in the short-run. The main impact has been to cut back on developmental drilling of new oil wells, rather than slowing the flow of oil from existing wells. This requires more patience," said a recent stability report by the Saudi Central Bank. In short, Saudi Arabia's policy of keeping production levels abnormally high and driving out U.S. shale producers simply has not worked. Even as U.S. shale hedges are about to expire, some of the imminent bankruptcies would not result in wells getting abandoned, it would only result in cheaper acquisitions of bankrupt companies by their much bigger competitors. Once oil prices again rise to $60 per barrel levels, the bigger oil companies would naturally ramp up their production levels, which would in turn increase U.S. crude oil production. Thanks to its generous public spending and a costly war against Yemen, one of the major worries for Saudi Arabia is that it is burning through its foreign reserves at an alarming pace. According to the IMF, Saudi Arabia's fiscal deficit could rise to around $140 billion by this year-end. From all this, it seems that the Saudis are now being beaten in their own game and have been trapped in the oil price war that they themselves created.